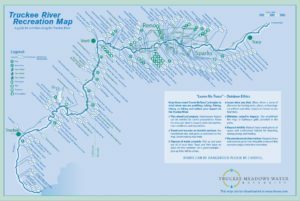 Truckee River Recreation Map – Learn about everything there is to see along the river! The Truckee River Recreation Map is a guide to river activities along the Truckee River. Learn about everything there is to do along the river and get informed about the obstacles you need to avoid! Take this map with you whenever you’re rafting, boating, ‘tubing, fishing, swimming, or just relaxing! The map illustrates all dams, river access, hot fishing spots, parks, drinking water, and telephones from Truckee to Tracy. Points of interest are indicated by mile notations. Rapid locations and level of difficulty are also clearly marked. Where does TMWA get their water supply?